In today’s harsh economy, more people than ever before are considering filing bankruptcy. 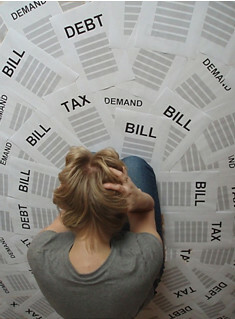 Oftentimes, people simply do not know where else to turn – especially when the bills come in faster than the income. Although it seems like there is no way out, there are some things to consider prior to taking the next steps to filing bankruptcy, as this procedure can have certain consequences on your future ability to borrow money and obtain credit. Therefore, if you are considering filing bankruptcy, take a few moments to come up with a financial “inventory” of the present state of your finances. Once you have deciphered which factor or factors have caused the situation with your current finances, you should determine where you stand at this time with regard to income and expenses. This will give you a “snapshot” of where you are going to start right now in turning things around. One of the primary criteria in coming up with your starting point is determining your current income. This includes both your gross income and your net income amounts. The gross income you receive is that amount that you earn before any taxes or other deductions such as retirement plan contributions are taken out. Your net income amount is that which you actually receive after all deductions. This is the amount with which you have to work with in terms of paying your bills and using for other expenses that you may have. As you go through your sources of income, make sure that you note whether or not there may be any changes over the next 12 months. For example, do you anticipate an increase or decrease in your wages from your employer? Will your alimony payments cease? Will the amount of income from a rental property go up or down? Once you have come up with an estimate of whether or not your current income will change, you should then move on to determining your overall expenses.